Chicken quesadillas are an easy weeknight dinner favorite at my house. They take no time at all to make and we always have leftovers for the lunch the next day. The tortillas are perfectly crispy and the filling is cheesy and delicious. They reheat well in the toaster oven, too! 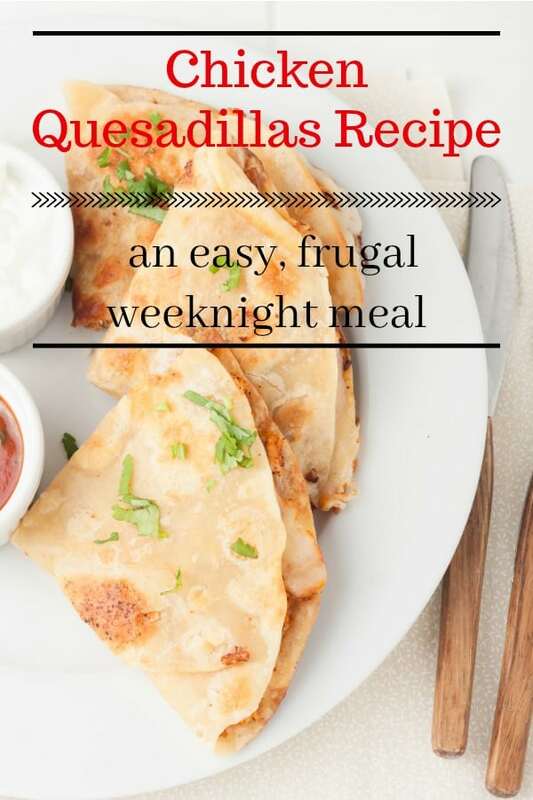 Oh, and these chicken quesadillas make a frugal family meal. In fact, I listed them as part of my One Chicken, Seven Meals guide. The best part about quesadillas, though, is that my kiddos love them. Everyone looks forward to dinner on quesadilla night. Check out my easy chicken quesadillas recipe below and feel free to add as many or as few fillings as your family wants. Before I share the recipe, I want to give you some ideas for additional ingredients. My kiddos like chicken quesadillas with just seasoning, chicken, and cheese in the tortilla, but I like to add a few things to make them extra delicious. My favorite chicken quesadilla fillings are sauteed mushrooms, sweet peppers, and onions. Beans, whole or refried are also delicious on a quesadilla. Diced tomatoes add a lovely pop of color and a nice flavor. Of course, adding avocado is always a hit. I dip my quesadillas in sour cream. Sometimes I serve the quesadillas with salsa, as well. Don’t be afraid to mix it up and try to new additions! The basic recipe is a blank slate for you to work with to create an amazing quesadilla. 2. Combine the chicken, salt, and seasonings in a bowl. 3. Put a thin layer of cheese on a tortilla, followed by a thin layer of the chicken mixture. 4. Top the chicken layer with another thin layer of cheese. 5. Put another tortilla on top of the cheese and chicken layers. 6. Cook on the griddle until the bottom is lightly browned and crispy. 7. Flip the quesadilla and cook the other side until it is browned. 8. Cut into halves or quarters and serve. 14-16 sprouted burrito-sized tortillas you may need more tortillas if you add additional ingredients like mushrooms, etc. Optional - Add any other fillings you'd like. Combine the chicken, salt and seasonings in a bowl. Put a thin layer of cheese on a tortilla, followed by a thin layer of chicken. Top the chicken layer with another thin layer of cheese. Put another tortilla on top of the cheese and chicken layers. Cook on the griddle until the bottom is browned. Flip the quesadilla and cook the other side until it is browned. Cut into halves or quarters and serve.